A DPW rendering of option 1 for Potrero between 22nd and 24th Streets, which has been selected after receiving the highest number of votes from the public. 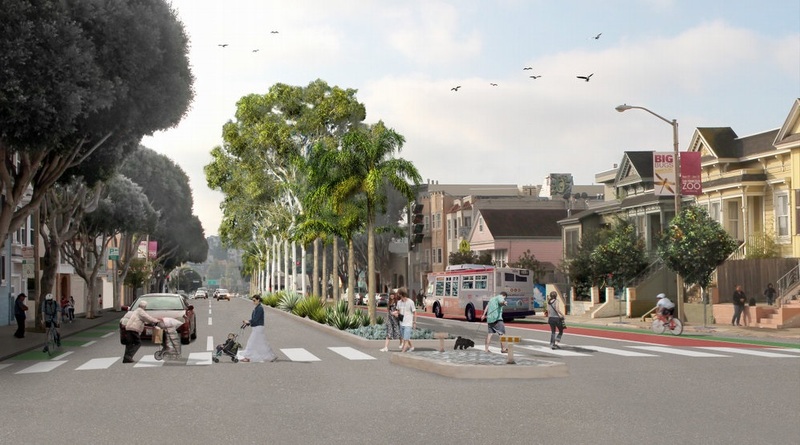 The Department of Public Works has selected a design option for the two most heavily-contested blocks of Potrero Avenue following a vote by attendees of two public meetings. Of the three choices presented for the section between 22nd and 24th Streets in front of SF General Hospital, the most popular was Option 1, which will allocate street space to wider sidewalks and a center median with plantings — not a bike lane buffer or car parking, as in the two other options, according to DPW. By November, DPW had settled on the plan for the rest of Potrero, between 17th and 25th Streets, which will include a planted center median (south of 20th Street), pedestrian bulb-outs, and green-painted buffered bike lanes. It also calls for moving the existing red-painted transit lane from the northbound side to southbound side and extending it a few blocks. No other section will get a full sidewalk widening other than the one side of the two blocks that the public voted on. Although DPW originally proposed widening four blocks of Potrero’s eastern sidewalk, planners downsized that part of the proposal after some people agitated to retain parking and traffic lanes for cars. However, according to DPW, in the vote on options for the two blocks between 22nd and 24th, only 25 percent of attendees voted for option 3 — the one that prioritized car parking. Walk SF Executive Director Nicole Schneider said the organization “is thrilled that DPW did not choose option 3, a plan to maintain sub-par sidewalks in front of a hospital.” The improvements in option 1 “can cut the number drivers that hit pedestrians in half,” she said. These improvements will transform Potrero Avenue into a safer and more attractive multi-modal corridor. The sidewalk widening will be especially beneficial for pedestrian comfort and safety, adding five feet to the existing narrow 9’-0” wide sidewalk. The bulb outs and refuge islands will shorten the crossing distances and provide more pedestrian visibility to motorists. The planted median will help calm traffic and green the corridor and the transit-only lane will provide time savings for all that commute by bus to and from the neighborhood. By picking a preferred option, we now have the opportunity to work with partner agencies to develop the plan in more detail. We got Castro Valley Boulevard, essentially. Transit first? Nope. People first? Nope. Quite disappointing. It says there’ll be no bike lane buffer, but will there still at least be a bike lane? Someone should pull a reverse-bike-injunction and sue the city over not following voter mandated transit-first policies.